And so, the thing is here and ready! Hopefully, I'll do the first battle. Make sure to check yours and be ready when it's your turn. Before you can run SSF though, you need to configure it properly. 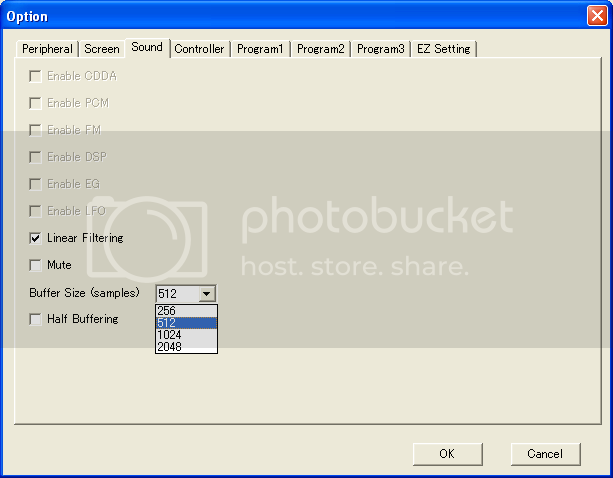 And since it's not that easy to configure a Saturn emulator, here are some guidelines and my own settings. Saturn BIOS: Download a Saturn BIOS file (Google one) and click on "browse" to select it (SF3 works with every BIOS). Don't forget to extract the file if necessary. CD drive: Select the CD device you're using to load the game. It can be either a virtual drive in which you mount the ISO of SF3 or a normal CD-ROM device in which you insert your original CD of the game. Cartridge: You should set this to "Backup RAM Cartridge" so that you can use both system and cartridge memory to store saves (Because the system memory alone is very limited). Area Code: Select the area code for your game. If you don't know its area code, test them all until the game can start. Enable "Auto Field Skip" (or VSynch Wait if you prefer fullscreen gaming). This is very important for speed. Also enable "Use DirectDraw" or "Bilinear Filtering" depending on your graphic card to smooth out the grahics. The rest is optional and has no real impact on speed or compatibility. 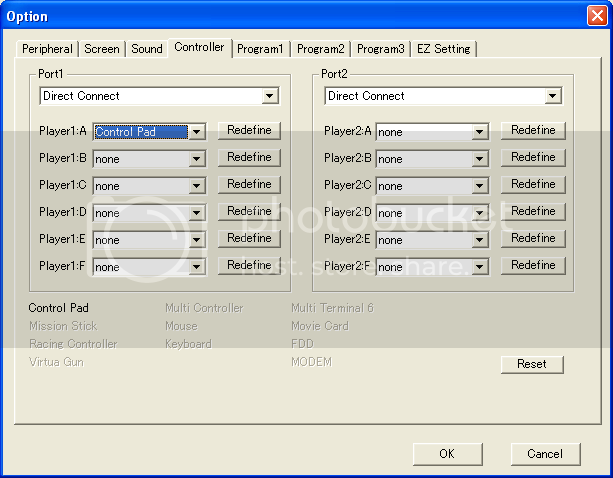 To the right of "Player1:A", click on "Redefine" and set controls accordingly. Keep everything enabled except for "CD Block No Wait" and "VDP1 Draw Thread". Right now I'm using the default values as it won't run for very long if I don't (repeated crash/freeze/funky things). You might be luckier than me though. 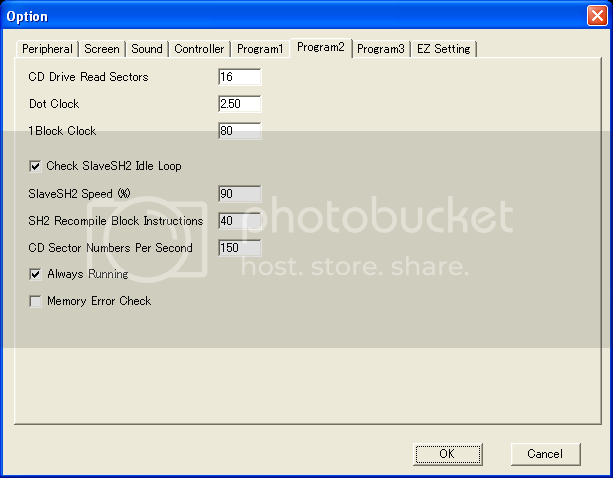 Key settings are the Dot Clock and SlaveSH2 Speed, and 1Block Clock to a certain extent. Uncheck "CD Access LED" to turn off the blinking led at the bottom right of the SSF window. Check "Check Cycle Pattern" for compatibility purpose. You can try out "Memory Access Wait" and "SH2 Cache" but this will weight on your processor. The rest, I haven't really tested. When you're done configuring, restart the emulator and access the memory manager by pressing F1. Clear the system and cartridge memory and restart again before playing. If you find a better configuration for SF3, PM me and I'll update this guide. If you still can?t configure SSF with those explanations, e-mail me your problem at the address you see in my personal profile and I?ll try to answer you. When we?ll start the game, I?ll create a RAM card (InternalBackupRAM.bin) and I?ll send it to the player who gets the first battle. Just put this file in the SSF folder. Note that if you started a playthrough of SF3, (like me and Noma) you want to put your current RAM card in another folder or this one will replace it. Once you completed your battle, save your game by talking to a priest at the church (always choose the system memory when you save) and e-mail me the file. I?ll send it to the next player, etc? Don't send me save states please. Also, due to a general request, the time limit to complete a battle will be 1 week. I can extend this limit if you provide me a good reason but I would prefer that you complete the battle in said delay or PM me if you can't, so that it doesn't slow down our progression too much. By now, whoever receives a battle will also indicate the approximative date of whenever he thinks he will get it completed. He has 2 days to do so, either by posting or PM-ing me. If I don't have any news of the player within this time limit, the file will be automatically sent to a reserve, and still under this rule. If the player exceed the date he mentionned, same result unless he gives me a good reason before said date. And as a last resort, I'll do the battle myself. Hmmm... Interesting. I get the two bandits battles. It surprised me as well! Nice battles. Especially Braff's. I don't know what you guys think, but I found that to be the hardest battle in the game actually. Wow. Switching Point, Skull Mage, And Arrogant. Lovely. ...And I'm counting on you for NOT letting ANY of the refugies die. We'll really need this exp. bonus as Alpha said. And there's sure to be some dark, sick humour thrown in too. Garzel is good. Very good. Braff is one of the tougher battles in the game. But not that hard with the proper strategy. I think I'm going to enjoy Aldur's battles this time around. Damn... General Franz battle... Don't like that one! Spiriel's troop are annoying... Nice to see it started by the way! Mmm...I don't like Shiraf's battle, it is too easy IMO. Although, I got a very harsh battle, against the Baby Dragon...I hate that battle. Let me guess, I shall not kill him? Hope next scenario I get better battles! Well, bring it, I'm ready...vacations are coming. Phew! Even if this battle wasn't that long, this report was awful to type. I explain, even when SSF's window isn't active, it still detect anything you type on your keyboard. So, when I'm writing my report and that I push buttons like F, D, S, V, G, or T (These buttons are part of my controler's configuration in SSF) I have some chances to completely mess my battle up! So, I'll also use my other PC next time. (one to play the game, and one to type the battle report ) Or maybe can I use a control pad I have if it's compatible with SSF? I'll try this and say if it works, so that you guys won't encounter the same problem while typing your report. EDIT : It did work! So, I'm not only limite to play with my keyboard now. Synbios finds 10 gold pieces in a shelf. Synbios finds a Healing Drop in a plant. Masqurin and Grace join the Force. Synbios opens a chest and finds a Potion. Synbios finds 5 gold pieces in a big shelf. Synbios finds a Large Mithril in a box. Synbios finds 5 gold pieces in a shelf. Synbios finds a Healing Drop in a barrel. Synbios gives a Healing Drop to Grace. Synbios finds a Medical Herb in a barrel. Synbios finds something in a shelf! Synbios finds a Health Bread in a treasure chest. Synbios bumps into some ill-tempered Imperial soldiers. Prince Medion and company step in and solve the problem. Everyone discuss for some time and then there are several explosions. Synbios and his friends return to the central district and are greeted by a strange masked monk. 4 other masked monks appear. Grace attacks Masked Monk.4 damages. 5 experience points. Masqurin casts Blaze 1 on Masked Monk. 10 damages : killed! 34 experience points. 50 gold pieces. Synbios attacks Masked Monk.5 damages. 27 experience points. 50 gold pieces. Found a Medical Herb. Masked Monk attacks Synbios. 3 damages. Masked Monk 2 attacks Synbios. 3 damages. Grace casts Heal 1 on Synbios. Fully healed. 10 experience points. Masqurin casts Blaze 1 on Masked Monk. 10 damages. 14 experience points. Dantares attacks Masked Monk 2.10 damages. 14 experience points. Masked Monk 3 (the most powerful) attacks Dantares. 3 damages. Synbios attacks Masked Monk 2.5 damages. 27 experience points. 50 gold pieces. Grace attacks Masked Monk.4 damages : killed. 25 experience points. 50 gold pieces. Masqurin casts Blaze 1 on Masked Monk 3. 10 damages. 13 experience points. Masked Monk 3 attacks Synbios. 5 damages. Synbios counter attacks. (-_- Im feeling unlucky there) 5 damages : killed! 26 experience points. 50 gold pieces. File sent to DW via MSN. The RAM refuses to load. I'm not sure what I'm doing wrong, so to be on the safe side, what steps am I supposed to take precisely? Strange... Did you put the file into the SSF folder? If so, did you configure the emulator as I explained in the other topic? And do you get any error message? EDIT: nevermind. I know what's happening. You're using an american version of the game while I'm using an european one. But just to be sure, can you send me a save file you made with you're version of the game, so that I try to load it? I can't do this battle due to some technical difficulties. I'll try to get them cleared up before the next one appears. OK, I send the RAM file to Janos then. I'm don't know, since we haven't tested this yet. Or maybe can you send me a saved game? I would like to be sure. I don't really check the yahoo account. Also, I still have some SSF configuration questions (didn't realize this thing was gonna take off so quick), but I'll just email those to Lord Oddeye later today. Don't worry though, I'll get my a$$ in gear.